Birth certificate, immunization records, books and iPads for us while we wait. I packed my bag, making sure I wasn't forgetting anything. We made the drive to school, Lucas and Alex walked into the gate to head to their classrooms, Ryder and I joined the line that was already forming one hour before the doors opened. One hour before we would hurry to scramble to fill out the paper work in order to get one of the coveted morning kindergarten spots. Just the previous day, we had been at the doctor, getting the last of his shots in order to be able to attend school. He didn't like it, telling me at the end that "I don't like this place." I held him close and carried him all the way out the car. His long body stretching over more than half of mine. His weight soon seemed heavy, but I still carried him. 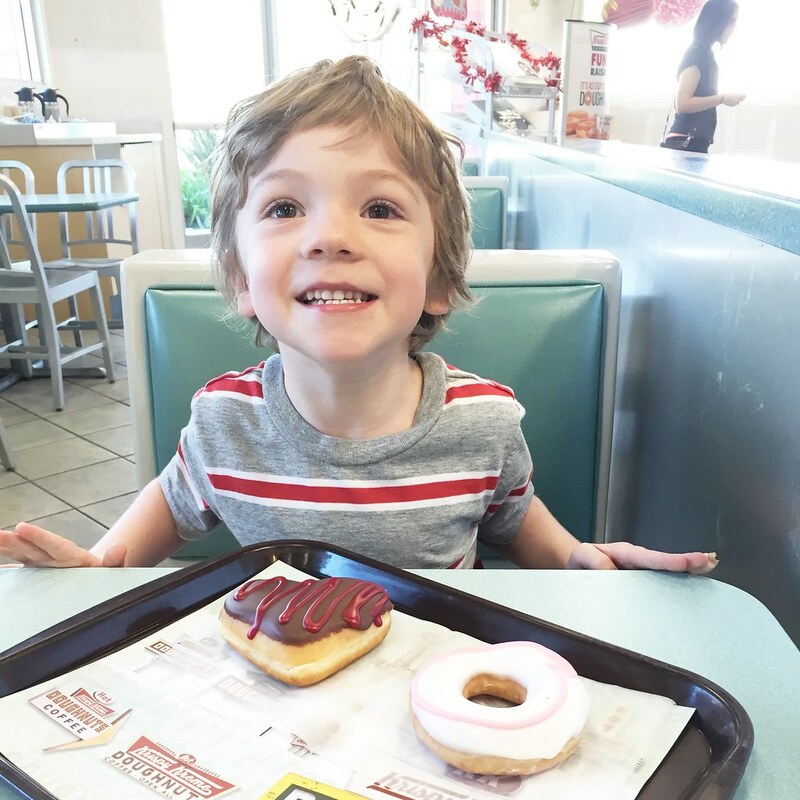 I promised him a donut from Krispy Kreme after his appointment, this helped slow the tears. The doors open, we go in one at a time and they hand us a packet to fill out. Why couldn't they give us these packets ahead of time I mutter to myself. I quickly fill out the forms. The order you were in line doesn't matter now, what matters is when you get your packet turned in now. I flip through the forms, trying to keep Ryder's birthday straight from his siblings. Done! I join the new line, the one where they check your forms, the line where they make sure that in your hurry you filled everything out right. Check, complete- he is officially registered for kindergarten. And now we wait, wait for May to find out if he made morning kindergarten. Wait for August for the new school year to begin, for my baby, my final child to take his steps into that kindergarten classroom. My heart breaks a little. Sure I will be honest, I look forward to some me time, some free time. A year ago I would have told you I couldn't wait for this day, even laughing at those parents that seem so sad about it. But I am going to miss him. I think it is going to be a shock to not have someone always by my side. I have had a child home with me for over ten years now. Yes, he is in preschool two days a week right now, but it just isn't the same. When real school begins, that is it. He will be in school until he has finished college, until he moves from home. It will be good, it is what he needs. I have no doubt that I will quickly fill my time, spend time helping in the classroom, maybe even join the PTA. But for today, as I start the process that is the beginning of it all, my heart breaks a little. I know, it really is so crazy I mean one minute he seems so big to me and the next minute he just seems too young to be going to school! It will be strange. I'm still not over my little one being in kindergarten this year. It breaks my heart a little every time I drop her off at school. Yes, for my first I definitely worried, wondered for a long time, with my middle I don’t think I thought much of it, now with my baby.. yeah like my first but almost worse all over again. My oldest started junior high this year, and I still cried on the first day of school, just like I did when he started kindergarten. Oh i will totally cry on the first day of junior high because junior high freaks me out! My oldest will be starting it in two years, well I guess more like a year and a half! Eek! This made me sad! I recently signed Lily up for Pre-K and I am truly sad about it. My time with her at home flew by! I know, it really does just go by way too fast! Oh, Emmy! I get it. I really do. Although I think you might have it a bit harder since you've had three. It makes the final one's move into school that much harder. I'm still trying to grasp the idea that my little Lexie will be in her last year of middle school next year. It makes me so sad to think she'll be leaving for college in just 5 years. I'm going to be an empty-nester so soon!! And I'm not exactly happy about it. Oh my gosh, can’t believe she is going to be in high school soon, I definitely will be freaking out about that I have no doubt.. though I think I fear junior high (which will be in two years for Lucas) more than I do high school, as just yeah junior high years everyone is so messed up. Awww such a big boy now! I know! I can’t believe it! With my oldest two while they seemed to grow up quickly now that it’s my baby it just is shocking. You have me crying... my baby is just almost 8 months old and I'm dreading this day! You still do morning/afternoon K there? we did when I was young but now it's all day.